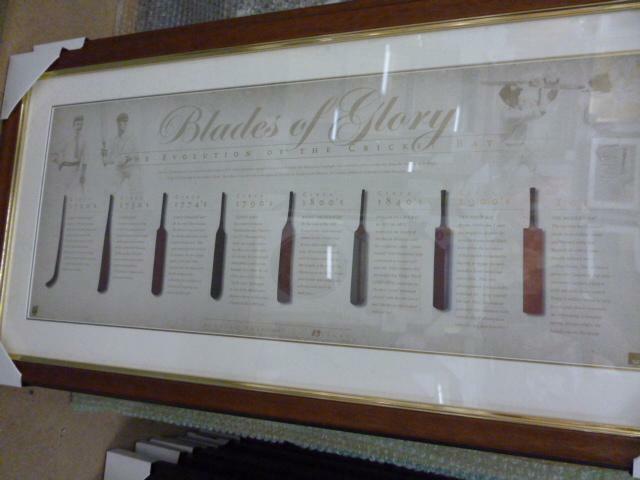 1624 - This is the first time that we have any mention of a cricket bat. An inquest was carried out after a fielder was killed. The batsman had tried to prevent him from catching the ball, and had presumably whacked him on the head in the process! Originally bowlers used to bowl the ball underarm. The cricket bat was therefore shaped very much like a hockey stick. 1770's - The laws were changed to allow "length bowling", which was still performed underarm. The cricket bat became roughly parallel with a maximum width of 4.25". This is still the same today. They were extremely heavy, with the "swell" at the bottom. 1820's - Round arm bowling was allowed, instigating more bounce so thecricket bat became lighter with a higher "swell". 1830's - Until this period all cricket bats were one piece willow. However, because of increased breakages and shock as the ball travelled faster,cricket bat makers started to "splice" handles into bats. Handles were either solid willow or ash. 1835 - The length of a cricket bat was restricted to 38", which is still the same today. 1840 - The first recorded use of a "spring" being inserted into the handles of the cricket bat. These were initially whalebone (as used in ladies corsets) and some years later India rubber. 1853 - Thomas Nixon, a Notts cricketer, introduced the use of cane in handle making in cricket bats. 1864 - The laws were altered to allow over- arm bowling so there was a further lightening and more refined shaping of the blade. Handles became intricate constructions and were nearly all made of cane with Indian rubber grips. 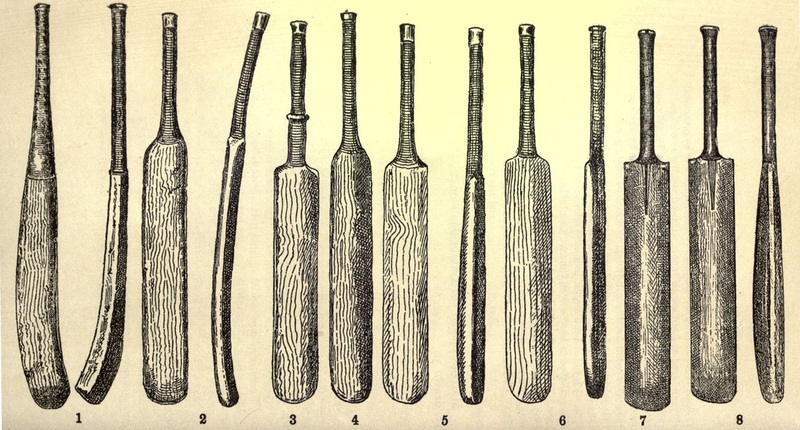 1870's - The shape of today's cricket bat evolves. I wonder if those cricketers of the 1600's would recognise cricket as the same game that they played. They certainly might look a bit mystified at today's helmets! A cricket bat is used by batsmen in the sport of cricket. Cricket bat is usually made of willow wood. Its use is first mentioned in 1624. This specialised cricket bat is shaped something like a paddle, consisting of a long, padded handle similar to - but sturdier than - that of a tennis racquet, which is usually cylindrical in shape. This widens into the blade of the bat, a wider wooden block flat on one side and with a V-shaped ridge on the other to provide greater air flow in the follow through. However the more important reason for the v in the back is for an increased power to weight ratio of cricket bat as it removes wood from areas where it isn't need while leaving the bat thick enough in the middle region where the ball is generally hit and greater strength to the over-all bat. The flat side (the front of the cricket bat) is used to hit the ball. The point at which the handle widens into the blade is known as the shoulder of the bat, and the bottom of the blade is known as the toe of the bat. The cricket bat is traditionally made from willow wood, specifically from the English Willow (Salix alba var. caerulea), treated with raw (unboiled) linseed oil. The oil has a protective function, but also increases surface friction with the ball, thus control. This wood is used as it is very tough and shock-resistant, not being significantly dented nor splintering on the impact of a cricket ball at high speed, while also being light in weight. It incorporates a wooden spring design where the handle meets the blade. The current design of a cane handle spliced into a willow blade was the invention in the 1880s of Charles Richardson, a pupil of Brunel and the chief engineer of the Severn railway tunnel. Law 6 of the Laws of Cricket,as the rules of the game are known, limit the size of the bat to not more than 38 in (965 mm) long and the blade may not be more than 4.25 in (108 mm) wide. Bats typically weigh from 2 lb 8 oz to 3 lb (1.1 to 1.4 kg) though there is no standard. The handle is usually covered with a rubber or cloth sleeve to enhance grip and the face of the bat may have a protective film. Appendix E of the Laws of Cricket set out more precise specifications. Modern bats are usually machine made, however a few specialists (6 in England and 2 in Australia) still make hand-made bats, mostly for professional players. The art of hand-making cricket bats is known as podshaving. Cricket bats were not always this shape. Before the 18th century bats tended to be shaped similarly to a modern hockey sticks. This may well have been a legacy of the game's reputed origins. Although the first forms of cricket are lost in the mists of time, it may be that the game was first played using shepherds' crooks. Until the rules of cricket were formalised in the 19th century, the game usually had lower stumps, the ball was bowled underarm (which is now illegal), and batsmen did not wear protective pads, as they do nowadays. As the game changed, so it was found that a differently shaped bat was better. The cricket bat generally recognised as the oldest bat still in existence is dated 1729 and is on display in the Sandham Room at the Oval in London.